The Thrashers take the puck into the offensive zone against the St. Louis Blues at Philips Arena on September 22, 2007. In May 2011, the Thrashers were sold to Canadian-based ownership group True North Sports & Entertainment. The group moved the franchise to Winnipeg, Manitoba, which became the second incarnation of the Winnipeg Jets. The sale and relocation were approved by the NHL on June 21, 2011. With the sale and relocation of the team, Atlanta became the first city in the NHL's modern era to have two ice hockey teams relocate to different cities. In both cases, the team moved from Atlanta to a Western Canadian city; the city's previous NHL team (the Atlanta Flames) moved to Calgary, Alberta, in 1980 to become the Calgary Flames. After the departure of the International Hockey League (IHL)'s Atlanta Knights (1992 to 1996) to become the Quebec Rafales, the city of Atlanta was awarded an NHL franchise on June 25, 1997, as part of a four-team tiered expansion. This also included teams in Nashville, Columbus and St. Paul, in which each new franchise would begin play as its respective new arena was completed. The birth of the new franchise marked NHL hockey's return to Georgia, as the Atlanta Flames, established in 1972, departed for Canada in 1980 to become the Calgary Flames. The Flames had been the League's first foray into the southern U.S., and their failure discouraged further efforts to bring NHL hockey to the region for another decade. The nickname "Thrashers," after Georgia's state bird, the brown thrasher, was selected from a fan poll. "Thrashers" had actually been runner-up to "Flames" in the poll (as a homage to the old Atlanta Flames), and Philips Arena, the Thrashers' new home, was built on the site of the former Omni, which had been home to the Flames. By coincidence, the first encampment (circa 1839) which would later become Atlanta was called Thrasherville, and a historical marker of this is located just down from the arena in front of the State Bar of Georgia (the former home of the Federal Reserve Bank of Atlanta). The newly formed Thrashers selected Patrik Stefan with the first overall selection and Luke Sellars with their 30th overall pick (second pick of the second round) in the 1999 NHL Entry Draft. However, the entire 1999 NHL Entry Draft was a major disappointment for the Thrashers, as all 11 of their draft picks were out of the NHL by the team's last season of existence; Stefan played the most games for the Thrashers from that draft, 414. Their first two picks (Stefan and Sellars) were called two of the biggest disappointments in draft history; NHL.com listed Stefan as the worst first overall pick of all-time and Sellars (who played only one NHL game) as the worst 30th overall pick in NHL history. This turn of events was a major surprise, as not only did the media hype Stefan as a franchise player, but hockey experts also considered then-Thrashers General Manager Don Waddell to be a man with excellent scouting ability. The Thrashers played their first game on October 2, 1999, losing 4–1 to the New Jersey Devils. Captain Kelly Buchberger scored the franchise's first goal in the loss and the team went on to finish their first season in last place in the Southeast Division, with a record of 14 wins, 61 losses and seven ties for a total of 39 points. Atlanta had the second overall pick in the 2000 NHL Entry Draft; this draft brought better results, as the player chosen with that pick, Dany Heatley, went on to become one of the team's best players. The team also had a fine choice in the 2001 Draft, with first overall pick Ilya Kovalchuk. Both Heatley and Kovalchuk played their first season in the NHL in 2001–02; both players were named to the NHL All-Rookie Team and Heatley was awarded the Calder Memorial Trophy as the League's Rookie of the Year. The early years of the Atlanta Thrashers saw a sharp increase of hockey fans in Atlanta. Ticket sales for Thrashers games averaged at 10,000 per night, with many of them being season tickets. The overall experience of a Thrasher's game was unique compared to other Atlanta teams. A section of the arena was dedicated to season ticket holders that called themselves the "Nasty Nest". The "Nasty Nest" would chant and shout at the opposing team to disrupt them while they played. The Thrashers also had two Thrasher bird heads that would face opposite to the scoreboard. The Thrasher heads would open their beaks to reveal a flamethrower, which would ignite when the team scored a goal. It was at this time that the franchise adopted a motto "Believe in Blueland" which was often used in advertising. Marcel Comeau was named director of amateur scouting for the Thrashers, on July 9, 2003, and stayed in the role until the team was sold. On September 21, 2003, Time Warner, the owners of both the Thrashers and the National Basketball Association (NBA)'s Atlanta Hawks, sold both teams to Atlanta Spirit, LLC, a group consisting of businessmen based both in Atlanta and elsewhere. Tragedy struck the team just eight days after the sale, as star forward Dany Heatley crashed his Ferrari in a one-car accident that seriously injured both himself and Thrashers center Dan Snyder. Heatley suffered a broken jaw and arm, a sprained wrist and a torn anterior cruciate ligament (ACL) and medial collateral ligament (MCL); Snyder died five days later due to septic shock from his injuries. The Thrashers dedicated their entire 2003–04 season to Snyder's memory, and Thrashers players wore black patches with Snyder's number, 37, on their jerseys for the season. Heatley's blood alcohol content was below the legal limit, but his combination of speeding (he was driving an estimated 80 miles per hour) and recklessness led to criminal charges, which were later dropped. He eventually received three years' probation and community service. Led by captain Shawn McEachern, the Thrashers jumped quickly out of the gate with some notable highlights. Ilya Kovalchuk scored eight goals in the first seven games, including two hat-tricks, one in a 7–2 rout of the Chicago Blackhawks and another in a come-from-behind victory against the Nashville Predators. Those comeback victories became a recurring sight throughout the season, as Atlanta pulled off stunning upsets over the Toronto Maple Leafs, Boston Bruins and Ottawa Senators, as well as wins against the Los Angeles Kings and New York Islanders. Eleven games into the season, the Thrashers were in first place in the Southeast Division and the NHL. Although they continued to play well, they could not keep up with the Tampa Bay Lightning, the eventual Stanley Cup champions, or other teams in the League. Boxing Day 2003 marked both a bright and dark day for the Thrashers. On that day, Heatley skated for the first time since his car accident with Snyder, but it also marked the last win for the Thrashers before an extended losing streak. From December 28 to February 11, the team went a dismal 2–16–3. However, fans were entertained regardless of the team's struggles. Kovalchuk became only the second Thrashers' player to score in the NHL All-Star Game (after Heatley). While the Thrashers' playoff hopes were done for the year, they finished second in the Southeast Division to Tampa Bay and tenth in the Eastern Conference, only a handful of wins away from the Stanley Cup playoffs. Kovalchuk tied for the League lead in goals (41) with the Calgary Flames' Jarome Iginla and the Columbus Blue Jackets' Rick Nash. Goaltender Kari Lehtonen began his NHL career with four wins in four starts, including one shutout. Before the start of the 2005–06 season, the Thrashers signed several NHL veterans in the hopes of making the playoffs, including forwards Bobby Holik and Scott Mellanby, defenseman Jaroslav Modry and goaltender Mike Dunham. At the same time, however, they lost one of their brightest stars, as Heatley requested a trade in an attempt to leave behind memories of his tragic 2003 car accident. He was eventually swapped to the Ottawa Senators in exchange for Marian Hossa (a four-time 30-goal scorer at the time of the trade) and Greg de Vries. The 2005–06 season saw the Thrashers win a club-record 41 games, even with numerous goaltending injuries. Only a few minutes into the first game of the season, Kari Lehtonen pulled his groin, an injury that would keep him out for a good portion of the season. Veteran backup Mike Dunham, an experienced number-one netminder, stepped in, but also promptly injured himself only a few games later; this left only prospects Michael Garnett and Adam Berkhoel to tend goal. Journeyman goaltender Steve Shields was signed, but he too was injured within ten games. On April 6, Lehtonen was run into by Tampa Bay's Chris Dingman, injuring him yet again. The remainder of the season was left to Dunham. Garnett was injured in a game against the Washington Capitals. Dunham, who had started the game but was relieved by the young rookie after poor play, was forced back into action in the third period. The Thrashers' 2006–07 season began with the highest expectations in franchise history, even after the team's second-leading scorer, Marc Savard, departed as a free agent for the Boston Bruins. Veteran center Steve Rucchin, Niko Kapanen and Jon Sim were acquired in an effort to make up for the Savard loss. With NHL superstars Marian Hossa and Ilya Kovalchuk, as well as a healthy goaltender in Kari Lehtonen, the Thrashers clinched their first (and only) playoff berth, winning the Southeast Division title with 43 wins and claiming the third seed in the Conference and home-ice advantage in the first round of the playoffs. However, they were eliminated from the playoffs on April 18, being swept by the New York Rangers in four-straight games in the Eastern Conference Quarterfinals. This season was the highest attended the Thrashers ever had, with every home playoff game sold out as well as the season opening and closing games. The team was gaining notoriety within the league for their playoff debut, and team popularity within Atlanta reached an all-time high. Even Hip-Hop artist Lil Jon expressed his support for the Atlanta Thrashers by wearing a Thrashers jersey while posing with the Stanley Cup. After this season, the Thrashers' ticket sales would start dwindling due to the housing market crash of 2008, and a stale economy in Atlanta. Although the ticket sales dropped, the fans remained loyal throughout the decline of the team. Just months after reaching the playoffs for the first time, the Thrashers began the 2007–08 season 0–6. Consequently, they fired Head Coach Bob Hartley on October 17, 2007, with General Manager Don Waddell taking over behind the bench on an interim basis. The Thrashers ended the season with only 76 points, finishing 14th in the Eastern Conference. On January 27, 2008, the Thrashers hosted the NHL All-Star Game at Philips Arena, matching the Eastern Conference All-Stars against the Western Conference All-Stars. The game had originally been scheduled for the 2004–05 season, but the NHL lockout of that year, followed by the 2006 Winter Olympics the following season and the Dallas Stars' hosting of the 2007 NHL All-Star Game, made 2008 the earliest available date. The Eastern Conference won the game 8–7, with former Thrasher Marc Savard scoring the game winner late in the third period. Although he was a member of the Bruins, the Atlanta crowd cheered Savard the entire night. On June 20, 2008, John Anderson was named as the fourth head coach in Thrashers history. In his first season, the Thrashers matched their previous season with 76 points, while finishing 13th in the Eastern Conference. Simultaneously, Atlanta Spirit, LLC, the team's ownership group, was coming apart at the seams. A dispute between Steve Belkin and his seven fellow owners dated back to 2005; Belkin claimed the other owners breached their contract, giving him the right to buy them out at cost, while his partners said they should be able to buy out Belkin's 30% stake. On November 3, court proceedings began in Maryland to decide the group's fate. In the final year of his contract, Ilya Kovalchuk and the Thrashers could not come to an agreement on an extension. General Manager Don Waddell reportedly offered 12-year, $101 million and seven-year, $70 million contracts, both of which Kovalchuk turned down. Rather than potentially losing him to free agency in the off-season, the team traded Kovalchuk on February 4, 2010, to the New Jersey Devils. Atlanta received defenseman Johnny Oduya, rookie forward Niclas Bergfors, junior prospect Patrice Cormier and a first-round pick in the 2010 NHL Entry Draft in exchange for Kovalchuk and defenseman Anssi Salmela; the teams also traded second-round selections in 2010. The Thrashers finished tenth in the Conference, with 83 points, which would be the most points they had earned in a regular season from the time they won the division title in 2006–07 to the team's eventual relocation in the summer of 2011. On April 14, 2010, three days after the finish of the 2009–10 season and after two unsuccessful attempts at making the playoffs, the contracts of Head Coach John Anderson and his coaching staff were not renewed. General Manager Don Waddell was promoted to president of hockey operations, while former Assistant General Manager Rick Dudley took Waddell's place as general manager. This was the only general manager change in Thrashers history. Dudley made his first trade on June 23, 2010, involving nine players and draft picks, with the Chicago Blackhawks. The Thrashers received Dustin Byfuglien, Ben Eager, Brent Sopel and Akim Aliu in exchange for Marty Reasoner, Joey Crabb, Jeremy Morin, the Devils' first-round pick (#24 overall) in 2010 and the Devils' second-round pick (#54 overall) in 2010. Later, the Thrashers also traded for Blackhawk Andrew Ladd while sending prospect Ivan Vishnevskiy and a draft pick to Chicago. The Blackhawks, the 2010 Stanley Cup champions, found it necessary to trade players for prospects and picks as they were in difficulty with the salary cap. The next day, the team named Craig Ramsay as the team's new head coach. Ramsay, who had been an assistant coach for the Boston Bruins for the previous three seasons, was a former NHL player who had been a teammate of Rick Dudley's on the Buffalo Sabres. In the following weeks, the Thrashers hired an associate coach, John Torchetti, and an assistant coach, Mike Stothers. The team also hired Clint Malarchuk as a goaltending consultant. 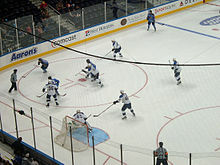 The Thrashers' last win came against the New York Rangers, 3–0 at Madison Square Garden on April 7, 2011. On April 10, 2011, the Thrashers played their last game in Atlanta against the Pittsburgh Penguins. Tim Stapleton scored the last goal in Thrashers history in a 5–2 loss to Pittsburgh. The final NHL goal scored in Philips Arena was tallied by the Penguins' Mike Comrie, an empty net goal and his first of the season. Due to financial losses and ownership struggles, the team was frequently a target of relocation rumors. In later years, reports saw the team courted by suitors intending to relocate to Kansas City; Quebec City; Hamilton, Ontario, or Winnipeg. On January 22, 2011, the team's ownership group claimed it had lost US$130 million in the last six years, partially as a result of an ongoing lawsuit with former partner Steve Belkin. In February 2011, majority owner Michael Gearon stated that the team would be seeking new investors. Various local groups announced their intent to purchase the franchise and keep it in Atlanta, but ultimately the team was sold to the Canadian group True North Sports & Entertainment. On May 16, the Atlanta Journal-Constitution reported that talks for a sale to True North Sports & Entertainment were underway. According to The Globe and Mail, a deal was finalized on May 20, 2011, to relocate the team to Winnipeg. The League later denied the report, but acknowledged that advanced negotiations between the two teams were underway and that NHL Commissioner Gary Bettman supported the move. Draft schedules were prepared that accommodated for the team's move to Winnipeg, as True North sought to move the Manitoba Moose of the American Hockey League (AHL), eventually moving the team to St. John's, Newfoundland and Labrador, in Atlantic Canada. On May 31, 2011, True North Sports & Entertainment and the NHL held a press conference in Winnipeg to announce the completion of a deal to purchase the Thrashers. True North intended to relocate the team to the MTS Centre in Winnipeg and on June 21, 2011 to become the revived Winnipeg Jets. Both the sale and relocation of the team were formally approved by the NHL's Board of Governors. The Atlanta Spirit Group, however, retained the rights and logos for the Thrashers. The Thrashers' colors were ice blue, navy blue, red and gold. In 2003, the NHL decided to switch home and road jerseys colors. In 2007, Reebok released new team jerseys as part of the rollout of the Reebok Edge Uniform System. Only the piping changed for the Thrashers' jerseys. Atlanta unveiled its new third jersey, red and midnight blue with white and gold trim, on October 10, 2008. The team's mascot was Thrash, a brown thrasher, which also is the official state bird of Georgia. 1 No. 99 was retired league-wide by the NHL in 2000 to honor Wayne Gretzky. The Thrashers never officially retired any numbers. No. 37 was unofficially taken out of circulation after the death of Thrasher Dan Snyder in September 2003. These are the top-ten point, goal, and assist scorers in franchise history. The Georgia's Own Credit Union 3 Stars of the Year Award was awarded annually to the Thrashers player amassing the most points throughout the season by being named as one of the three stars of each game. The award was created in the Thrashers' inaugural season of 1999. The Atlanta Thrashers were broadcast on cable television on SportSouth and Fox Sports South. Radio coverage included play-by-play of all games on 680 The Fan in Atlanta. The station was the flagship of a network that included 18 stations. Most were in Georgia, but there were two affiliates in South Carolina and one in Scottsboro, Alabama. The radio play-by-play voice for the first season was Scott Ferrall, followed by Dan Kamal. Wikimedia Commons has media related to Atlanta Thrashers. ^ "NHL Board unanimous on Winnipeg sale, relocation". NHL.com. June 21, 2011. Retrieved June 21, 2011. ^ "Atlanta Thrashers Draft History at Hockey Database". Archived from the original on 2010-06-11. ^ Kreiser, John (2009-06-15). "The best picks ever, No. 1-30". NHL.com. Retrieved 2009-06-25. ^ "1972 NHL Amateur Draft – Marcel Comeau". Hockey Draft Central. Retrieved 2018-09-30. ^ "A Sadness In Atlanta". Sports Illustrated. 2003-10-13. Retrieved 2010-09-06. ^ "Felony charge dropped for Thrashers star's plea". 2005-02-05. Retrieved 2011-11-04. ^ "Thrashers to Winnipeg rumour wishful thinking". 2010-02-17. Retrieved 2011-02-28. ^ a b "Group wants to move Atlanta Thrashers to Hamilton". The Star. Toronto. 2009-05-09. Retrieved 2011-02-28. ^ "LAWSUIT CLAIMS THRASHERS HAVE LOST US$130 MILLION SINCE '05". 2011-01-22. Archived from the original on 2011-01-25. Retrieved 2011-01-23. ^ "Filmmaker Stephen Rollins interested in Thrashers". 2011-02-17. Retrieved 2011-01-26. ^ Ozanian, Mike (2011-05-02). "Atlanta Thrashers Will Likely Be Sold For $110 Million". Forbes. ^ Brunt, Stephen (22 May 2011). "Atlanta Thrashers moving to Winnipeg". The Globe and Mail. Toronto. Archived from the original on 20 May 2011. Retrieved 19 May 2011. ^ Zwolonski, Mark and Kevin McGran (2011-05-20). Atlanta Thrashers’ move to Winnipeg not complete, parties insist. Toronto Star. Retrieved 2011-05-20. ^ Lawless, Gary (2011-05-17). Few hurdles to potential Thrashers sale to WinnipegArchived May 22, 2011, at the Wayback Machine. Montreal Gazette. Retrieved 2011-05-20. ^ Short, Robin (2011-05-24). AHL return waiting on first ’Peg Archived 2018-05-15 at the Wayback Machine. St. John's Telegram. Retrieved 2011-05-24. ^ "Thrashers Unveil Third Jerseys". 2008-10-08. Archived from the original on 9 October 2008. Retrieved 2008-10-10. , including a photo timeline of Thrashers jerseys.